Presidential candidate Jon Huntsman speaks August 4 to members of the Derry, New Hampshire, GOP committee. 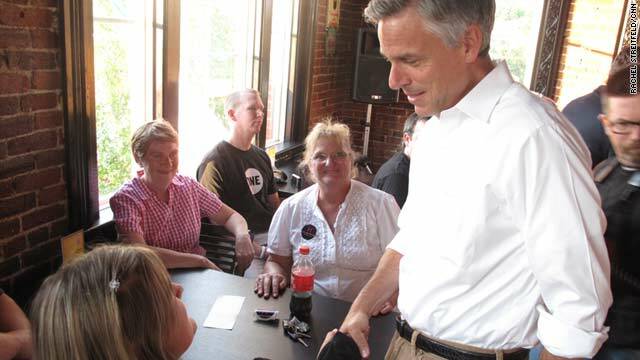 Manchester, New Hampshire (CNN) -- On a breezy evening in August, Jon Huntsman walked into a house party filled with undecided New Hampshire voters and started shaking hands. Across from the table of hors d'oeuvres, State Rep Joanne Ward, R-Stratham, noticed something was off. And when the GOP presidential candidate made his way to her, she chided him on it. "I want to know why when you came in you went to the left, instead of the right," she said, laughing. "I strategically said, he's going to start to the right." Huntsman laughingly blamed his veer to the left on the flow of the room, and promised he would remember Ward's tip in the future. But as he traverses New Hampshire, the man who served as ambassador to China under President Obama may get a boost from voters near the middle. New Hampshire holds a semi-open primary in January, in which a huge swath of undeclared independents may choose to vote in either the Democratic or Republican race. Of all registered voters here, 42% are undeclared, according to the New Hampshire secretary of state, and with no contest for the Democratic nominee, independents have an outsized influence on the Republican primary. Sen. John McCain, R-Arizona, benefited from that middle of the road constituency when he won the state's primary in 2008, setting up his path to the GOP nomination despite a loss in the Iowa caucuses. Huntsman is not putting resources into Iowa, which tends to reward social conservatives, and New Hampshire is probably the biggest hope in 2012 for the candidate who barely registers in recent national polls. On a recent visit to downtown Manchester, the former Utah governor worked his charm on Angie Content, co-owner of the Styling Souls salon. An undeclared independent voter, Content supported Obama in the last election but said she's shopping around for a new candidate. "I'm not happy with what he's doing with the country," she said of the president. Another independent, physician Cindy Cooper, attended a house party for Huntsman this week. Socially, Cooper tends to agree with Obama, especially on issues like abortion and gun control, but she's hoping for a more "fiscally responsible" candidate who would balance the federal budget. "If it was between Obama and him I would really have to sort it out," she said. Cooper was impressed by Huntsman's support of Washington's debt deal -- an agreement slammed by every other major GOP candidate. "Huntsman's been the one so far who's even tried to compromise with the budget," she said. In many of his stances, however, the governor has moved to distance himself from the president and fought back against claims that he is too liberal to top the Republican ticket. Huntsman has harshly criticized what he calls the president's "failed" handling of the economy and charged that Obama's lack of leadership on the debt ceiling negotiations almost brought the financial sector to a standstill. "It would have been better if we had a head start and we actually had some leadership to begin with, if we actually took a look at problem solving months ago as opposed to hours before the deadline,' he told patrons at a Manchester pizza parlor. And at an event in Derry, Huntsman told a group of Republican voters he would issue an executive order abolishing "Obamacare" his first day in office because the measure couldn't be broken down to meet the needs of each individual state. But Huntsman supports other initiatives that could win more bipartisan support. He maintains the U.S. should significantly draw down ground troops from Afghanistan and let the Afghans run their own country. He also supports the DREAM Act, which would give certain illegal immigrants who were brought into the country as children tuition assistance and a path to citizenship. "I believe that young kids when they're dragged here to the United States have no say over their journey. They have no say over their destiny," he said at an event at the Salem Chamber of Commerce. "And we either have a two-tiered bifurcated system or we allow, somehow, people to achieve the American dream." Asked about his bipartisan appeal, Huntsman first emphasized his unofficial campaign slogan of "conservative problem solver" and pointed to his record as a tax-cutter in Utah. But the governor knows undeclared independent voters could be key to his success in the state. "You gotta get votes to win, and the primary in this state is open last I saw," he said. "I'm going to get to know everybody in this state, and we're going to get every vote we can. Every vote matters." Huntsman's big challenge will be to appeal to moderate independent voters in New Hampshire without turning off die-hard conservatives elsewhere in the country. "Gov. Huntsman has a proven track record as a conservative problem-solver who cut taxes, passed free-market health care reform and oversaw the best state for job growth in the country," said Huntsman spokesman Tim Miller. "We're confident that record is going to appeal to a wide-swatch of voters."